Thank you so much to author Sandra Vasoli for this guest article on the beautiful British Library girdle book that has been linked to Anne Boleyn. Sandi is the author of Anne Boleyn’s Letter from the Tower: A New Assessment and the Je Anne Boleyn novels. Snuggled on a bed of faded rose velvet lies an ancient and exceptional golden jewel. When the cover of a small but stately leather-bound case is opened, the jewel greets the viewer, and its beauty elicits a gasp. Its permanent home is now within the confines of the British Library’s esteemed archives. Gleaming soft and mellow with age, the quality of the pure gold from which it’s made is apparent at very first glance. Lifting the tiny, precious jewel-book from its resting place, its heft and solidity assure that it was, in its time, a treasure worthy of royalty. The little book has presence. In fact, it inspires a great deal of awe for an object so very small: only 1 and 7/8 inches by 1 and 3/8 inches, it is a marvel of craftsmanship. The covers are finely wrought gold: open tracery that looks like the most delicate gothic window: ingeniously, they allow a peek within. At one time, long ago, black enamel accented the ornate frames surrounding the centre tracery – both front and back. The spine of this tiny volume is stunning. 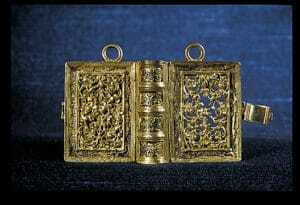 Constructed as if it were a book of significant size, the spine is supported by five horizontal ribs of precious metal. It lends the piece its substance. What is this mysterious treasure? Why is it so protected? Known in the British Library’s catalogue of Manuscripts and Archives as Stowe MS 956, it is described as “The Penitential and other Psalms, in English verse”. John Croke, Esquire, translated it into English during the time of Henry VIII. And legend has it that this book belonged to Queen Anne Boleyn… that it may have been with her when she stepped onto the scaffold on the morning of 19 May 1536, to be executed at the order of her husband, Henry VIII. It is true that there are historians and writers who do not believe the golden book was Anne’s possession. I, on the other hand, feel convinced that it was. Girdle books were initially popularised in the 13th century by devout monks who wished to keep their devotionals close at hand. They were typically small books, whose leather bindings extended such that they could be tied to a belt, and thereby be accessible throughout the day. Books were valuable, so wearing one attached to a girdle, or belt, also afforded the owner protection from theft. As time passed and the trend grew more fashionable, the wealthy – especially women – wore such books attached to their girdles; the cost of such a devotional adornment was often reserved for nobility. Most often the ornamental books were bound and tooled in leather. Stowe MS 956 is unusual. It is worked in gold; it is exceptionally tiny, and it has but one ring each soldered to the tops of the two covers – which enabled a fine chain to be looped through it for wearing. I think this particular book, due to its beauty and size, may have been worn primarily about the neck, as an elegant, useful pendant. There is a clever latch attached to the middle of the book cover; one presses the pages closed to unhook the latch, then the book can be opened. The first page is imprinted with the British Library’s shelfmark. 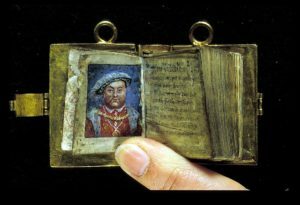 But turning to the second page, the viewer is faced with a miniature portrait of Henry VIII. The portrait is interesting and significant. Undoubtedly the King; his face is rendered straight on. Most curious is the open expression he wears; his mouth is upturned in an unmistakable smile. He gazes frankly and almost intimately at the viewer. Which artist painted this portrait of a youngish looking, happy King Henry? It is not known – however, it seems fairly certain by comparison that it’s not the work of Holbein. It just doesn’t seem to show the detail, or the level of mastery Holbein’s miniatures reflect. But what of an apprentice of Holbein? Or someone who admired his work? Might it have been the product of Lucas Horenbout, the other court miniaturist? I am not an art historian, so wouldn’t venture to say, but the portrait in the tiny book doesn’t look too far afield from some of Horenbout’s images. Might it have been Lucas’s sister, Susannah? She is also known to have painted miniatures in the Henrician court. There is a miniature of Henry VIII known to belong to the Buccleuch collection at Bowhill House in Selkirk which looks similar, in many ways, to the book’s portrait. The identity of the artist is a mystery – what is not, though, is the interesting positioning of the image in the golden jewel; especially noteworthy due to the sitter’s expression. The dating of the painting fuels the great debate over the ownership of this book. Some state that it is copied from the existing Holbein Whitehall painting created in 1536. If that were the case, the argument is made that the book could not have belonged to Anne, who died in that same year. On the other hand, if an unknown artist rendered it at an earlier point in time, it is entirely possible. Others feel that the miniature portrait may have been a later addition to the book. The British Library experts do not agree with this suggestion. There is no consensus on any option, yet the British Library refers to the ownership by Anne Boleyn in its catalogue details. The beginning pages of the little book are well worn and well-thumbed – they must have been read regularly. And as for many other volumes, the middle part and the last pages look brand new – almost unopened. The writing on those pages is fresh and visible, the pages hard to turn. The writing on the early pages, though, is worn off in some places, and difficult to see. This reinforces my thinking that the book was used mostly as a beloved ornament, with some regular referral to the initial pages – especially the page opposite the portrait of Henry. Might the book have belonged to Anne Boleyn? I believe it did; it was something she wore about her neck, or perhaps at times from a golden girdle chain about her waist. I think it was a private gift to her from Henry, either before or just after they married. I think the rendering of his portrait, with its unusual expression, is an indication that the item was his gift to her, and he looks at her from the first page. I can picture her opening it often to look at his portrait, and then, of course, to read the psalms at the beginning of her little treasure. George Wyat, born in 1553 and a grandson to the poet Thomas Wyatt, a friend and great admirer of Anne Boleyn, was, like his grandfather, a writer. 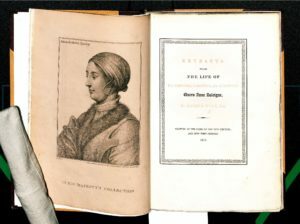 He wrote a book titled The Extracts from the Life of the Virtuous, Christian and Renowned Queen Anne Boleigne / Written at the Close of the XVIth Century and Now First Printed 1817. There were but 27 copies of this book privately printed, and the British Library owns six of them. Much of Wyat’s account was informed by Anne’s former lady-in-waiting, Anne Gainesford Zouche. He derived her first-hand testimony to his content; although from an elderly woman, it seems logical that major events during those turbulent years would be memorable enough to recount accurately. She reported to Wyat that the Queen handed the book, while on the scaffold, to one of her maids – a member of the Wyat family (presumed to be Margaret Wyatt, Lady Lee – a dear friend of Anne). It seems that the little prayer book was then kept by the Wyatt family for many years, having been seen in the Wyatts’ collection in 1721. The narrative of the book’s provenance becomes exceptionally confused because there are – or were – two girdle books which have been described in historical records. So due to circumstances of mystery and miscommunication (which often happens in the retelling of history), the facts have become blurred. An article in the journal Archeologia by Robert Marsham (1872) gives the description of a small girdle book with the Anne legend attached. The sources he cites add more puzzling detail until he admits that there are two such books, and that due to their descriptions they can’t possibly be one and the same. Some accounts describe Anne giving presents of such girdle books to her ladies – even while she was on the scaffold preparing to die. There is no evidence whatsoever which gives credence to this tale. So, it remains that we must study the lovely jewel which is present and visible in the British Library today. What seems to be accurate is the narrative told to George Wyat by Lady Zouche in which she describes Anne handing the book to a member of the Wyat family (Lady Lee) before the swordsman levelled his fateful swing. To me, this makes sense: the book was tiny and easy to hold, it was beloved to her, and it offered comfort as she walked her final steps in life. And just before her death, she passed it to someone she loved and trusted to care for it. You can read about the other girdle book linked to Anne Boleyn in the article Anne Boleyn and the Wyatt Prayer Book – The Prayers of Anne Boleyn? Sandra Vasoli grew up in a suburb of Philadelphia, Pennsylvania, USA. As a child, she developed an abiding interest in objects and stories from a long-ago era: historic houses, antiques, period clothes, and tales from the past. A passionate reader and enthusiastic writer, she also spent her formative years caring for dogs and riding horses; the love of animals factors large in her writing. 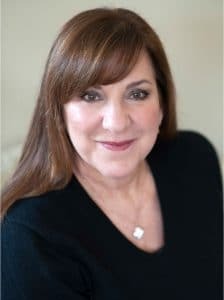 She earned degrees in biology and English from Villanova University, and then pursued graduate work in organizational development during her long career in human resources. As a human resources officer for several Fortune 500 global companies, she honed her ability to observe and read the behaviors of people, which contributes to her poignant character development. After leaving the corporate world, Vasoli wrote and published her debut novel, Struck With the Dart of Love: Je Anne Boleyn. Uniquely positioned as a Anne Boleyn’s memoir, it is the story of the tumultuous relationship between Boleyn and Henry VIII of England. With a deep appreciation for meticulous research, Vasoli was permitted rare access to the Papal Library at the Vatican, to read and study the original love letters penned in the 16th century by Henry VIII to his second wife, Anne Boleyn. She has also done extensive research in the British Library, viewing the beautiful Book of Hours in which Henry and Anne both inscribed lovers’ messages to each other, and documents attributed to a mysterious letter purportedly written by Boleyn while she was imprisoned in the Tower before her execution. The result of that research has been published in Anne Boleyn’s Letter from the Tower – A New Assessment. The second novel in the two-part series is available now. Entitled Truth Endures: Je Anne Boleyn it is available on e-reader and in paperback. Sandra Vasoli lives in Gwynedd Valley, Pennsylvania. The British Library Board, Stowe MS 956. Photo of author Sandra Vasoli. The Life of Anne Boleyn Colouring Book – available for pre-order now! Thank you for this very interesting article. I enjoyed reading it as well as seeing the pictures. It’s a beautiful item and apparently well used in its time. After reading the author’s description, especially of the unusual apparently personal portrait of Henry inside I tend to agree that it most likely belonged to Anne. Perhaps someday that will be proven or disproven. In the meantime a most intriguing little artifact of Henry’s reign. Thank you Claire for sharing that. I was lucky enough to see this little treasure when I visited the 1991 Henry VIII exhibition at Greenwich. Very beautiful! I too have heard the tale of how Anne minutes from death, handed the book to Margaret Lady Lee, a long time friend of hers and sister to Sir Thomas Wyatt, the famed poet and one time suitor of the doomed queen, and how out of reverence to her they kept it in ther family for generations, it certainly is a little gem, so dainty and one can imagine Annes long delicate fingers caressing the pages as she turned each one over, the smiling picture of Henry V111 looks almost Victorian to me, his face is rosy smiling and cherubic, resembling the angels and cherubs that the Victorians were so fond of, this book is exquisite and I think should really be housed in Hever but the British library are no doubt looking after it, a charming little relic from the 16thc century and absolutely fascinating if it actually did belong to Anne, the passage from the psalm that reads ‘when thy stroke cometh’ seems to refer to her terrible end, if the Wyatt family still possessed it in 1721 that means that they had kept it for nearly 200 years, long after its owner Lady Lee, had gone to her grave if the tale is true, I wonder how it ended up in the British library, I wish Henrys love letters to Anne were in England too, how frustrating that the Vatican houses them, the actual proof of a love story that had rocked the world and ended in such a bloody way. wonderful article Sandy! Who else could this belong to, if not Anne. What an amazing, gorgeous little book – I wish I had seen it in person. This is a beautiful little golden very precious book, as ladies carried at their girdle, with a lovely portrait of Henry Viii and it is very intriguing as to whom it belonged. It could very well have been a gift to Anne and held in special care, but the fact remains it can’t be proven that it belonged to Anne Boleyn. It is a very rare and beautiful item and it would be lovely to be able to confirm one day that it did indeed belong to our Anne. Anne was interested in reforming the English Church and the literary and religious books being translated into English. A translation of the Psalms and Prayers with a Puritanical element to them, would appeal to Anne and her friends as part of that arena. She wasn’t a Puritan or Lutheran but she did favour the Scriptures translated into the common tongue and she did support reforming preachers and books. Anne would certainly have had such a little book and the quality suggests to me a gift from the King or a noble friend or patron. The portrait inside also suggests a link, a personal link to Henry and Anne, a portrait by an artist of their association and the quality is exquisite. I believe I may have seen it in 2009 in the exhibition to mark the 500th Anniversary, yes it is very dainty and truly lovely, it is indeed a special and precious item. Thank you for this lovely article, Claire, thanks Sandra for studying this beautiful item.